Hope you guys had a wonderful Eid. About year ago I posted traditional way to cook chicken roast. But I get mixed impression for it. Some said about too many ingredients. Some said too length process. Some said its too old. So I think to make it the way to fit our modern (pardon I wanted to say abroad kitchen). So this roast will be in oven. 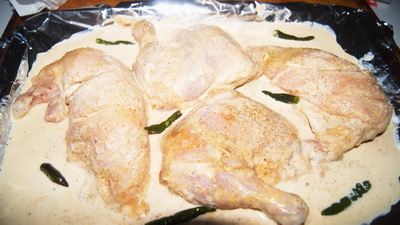 You can marinate chicken with all spices and bake it for 1 hour to make it simpler. But I spent some time on it and took out it from oven twice to make it perfect. I used cream in this recipe, if you dont have cream, boil half litre milk and when it reduced to 300 ml , use it instead of cream. Hope you like my recipe and don’t forget to like facebook page. Thanks. • 2 chickens (size 8) • 3 cup sliced onion • 2/3 cup yogurt • 300 ml cream • 2 tablespoons ginger paste • 1 tablespoon garlic paste • 2 tablespoon sugar • 1 and ½ tablespoon lemon juice • 1 teaspoon cardamom powder • 1 teaspoon cinnamon powder • 1 teaspoon pepper crushed • ½ teaspoon mace • ½ teaspoon nutmeg powder • 2 teaspoons salt or salt to taste • 2 bay leaves • 4-5 green chillies • 1/3 cup oil • 3 tablespoons ghee Also need oil for fry the sliced onion. 1. 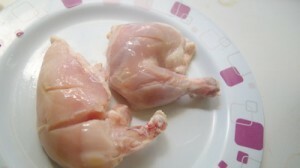 Cut the chicken into four pieces and cut 1-2 slits on each piece. 2. Clean and wash well. Pat dry it and mix lemon juice, yogurt, ginger, garlic, coriander, nutmeg, mace, pepper, cardamom, cinnamon, bay leaf, oil and1 teaspoon salt. Let it marinate for at least ½ hour. 3. Fry the sliced onion in oil till it becomes golden brown. Take out fried onion from oil and keep aside. 4. Preheat the oven to 180°c. 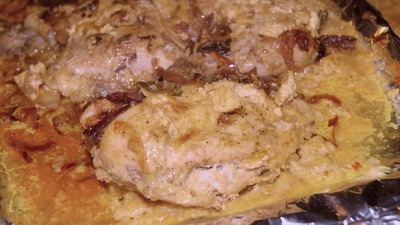 Take the baking tray and place chicken pieces over the tray in one layer. add cream and green chillies and bake it 15 minutes. 5. Take out the tray and add fried onion. Bake it for 30 minutes. 6. Take out the tray and flip the chicken pieces and add ghee and sugar. Bake 15 or until it becomes tender. 7. 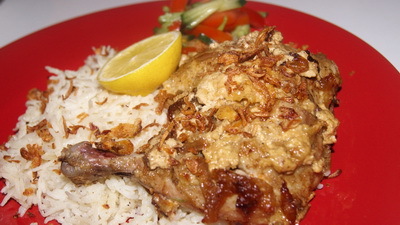 Take out Chicken Roast from oven and serve with polau rice. if you dont have cream, boil half litre milk and when it reduced to 300 ml , use it instead of cream. or make thick milk with milk powder. i have a question about one of the ingredients. what is cream/what kind of cream? where do you buy it from? Where do you live? If you are living overseas, you will get cream in any supermarket. If you live in BD, then I am sorry, I dont know where to go. But as a alternative you can thicken up milk then add it. Thanks.